Media and Contents: Soft cover, landscape format, 49 pages plus covers (incl. 2 pages and front and back in full color). Advantages: A broad overview of the DB-3 / Il-4 giving a good introduction to this bomber. Once again we are confronted by a Russian bomber with various designations (First time was in my review of the SB Bomber monograph). In this case the Ilyushin Il-4 was first designated as the TsKB-30, which was the initials of the Central Design Bureau (Tsentral’naya Konstruktorskoe Byuro) for which Sergei V. Ilyushin was head of the No. 3 Brigade. The bomber then acquired the designation of DB, which stood for Long-Range Bomber (Dal’nyi Bombardirovshchik). I’m not sure what the designation –3 was for. The “2” in SB 2 indicated 2 engines. But, the Il-4 had two engines also. 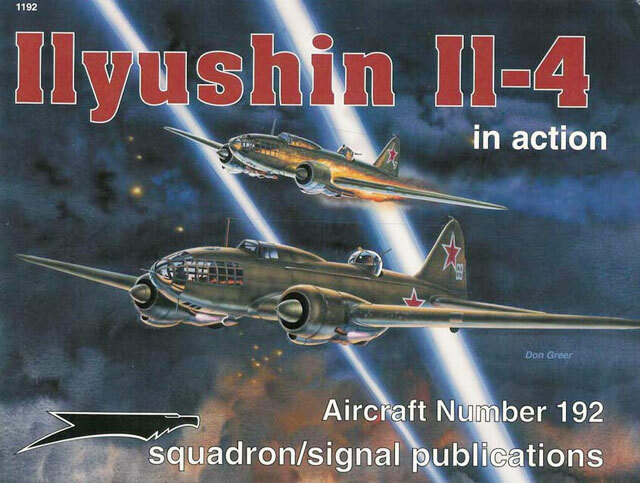 Finally, Il-4, this was the designation granted on 26 March 1942 to honor Sergei Ilyushin. Presumably Sergei was “in” with Comrad Stalin at this point. The “-4” in this case indicated it was a bomber, as Stalin decided that fighters should have odd numbers and bombers even numbers. Within each section there is a good technical overview and a description of the changes made to each variant. There is also a brief description of the camouflage applied to that variant. Of course, what would any discussion of Soviet WW-2 bombers be without a discussion of their service in the Finnish Air Force. In this case, a number of Il-4 variants (DB-3 and Il-4) entered service with the Finns either through capture or purchase from Germany. There is an all too brief overview of the DB-3/Il-4 in combat. It first saw action in China against the Japanese. It was the VVS bomber that bombed Berlin. But, like most VVS aircraft, its role was primarily tactical, rather than strategic. As with all “in action” books, the pictures become primary. There are especially good pictures of the cockpit and other interior areas. There is also the color centerfold collection of aircraft, and two more color drawings on the back cover. Over the past several years, the archives of the Soviet Air Force have yielded information and unseen photographs. I presume that monographs such as this “in action” are the beneficiaries. Hopefully, we can expect more to appear on VVS aircraft. As for this “in action” on the Il-4, I recommend it to any one who has an interest in the VVS during the Great Patriotic War.